Some new options mean that securing a height-of-the-season campsite is no longer an impossibility. S’mores? Firewood is ample at the Bogachiel River Campsites near LaPush, set on some 60 acres of property near the slow-flowing river. It’s summer in Seattle: warm temperatures, blue skies and long days—the perfect time to load up the car for a camping trip. The only problem: You didn’t reserve a campsite months ago, and snagging a last minute spot during the warm-weather months, especially over a weekend, is notoriously difficult in our region. And if you’re hoping to score a site away from a neighbor’s barking dog or avoid rambunctious kids riding their bikes around your campfire, some of the region’s most popular campgrounds may lack the vibe you’re hoping for. But thanks to a new wave of online services, finding your perfect campsite may be as easy as booking on Airbnb. The pioneer in the field is Hipcamp, launched in 2013 to help connect private landowners hungry for new revenue streams with campers looking for great places to pitch a tent for the night. What started with a few campsites scattered around the San Francisco Bay Area (where Hipcamp is based) has bloomed into a network of thousands of private campsites across the country. And last year, Hipcamp started adding public campgrounds to its database so users could be sure to know their options when planning that next excursion. Here’s how it works: Log onto Hipcamp.com and type in a location. The results page will show a map with markers for Hipcamp sites available in the search area. From there, you can refine your search with various filters (waterfront site, toilet, pets?) and then pick the winner based on availability. Just like Airbnb, owners set whatever prices they want, and you pay directly through the Hipcamp website, so there’s no need for any cash to change hands on site—in fact, chances are you won’t encounter the landowner at all. Availability of Pacific Northwest Hipcamp sites is rapidly expanding: The company sees Washington state as a major growth area, given Seattleites’ penchant for outdoor recreation. 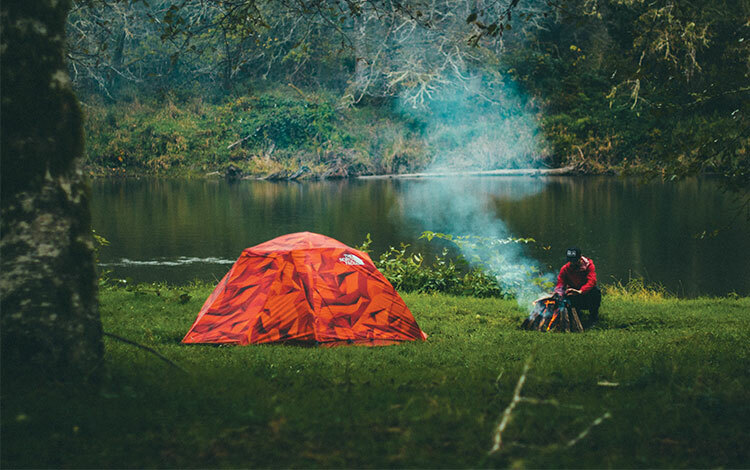 There are unique opportunities (see the following examples), as well as more traditional campsites among the hundreds of private Washington Hipcamp sites. With a little due diligence, your own private slice of backwoods heaven is just a car ride away. Who knew camping could be this interesting? Photograph by Evan Kubena. Hipcamp lists hundreds of private campsites in Washington including The Landing near Index on the South Fork of the Skykomish River. Help restore the land at Copper Moon in the misty woods north of U.S. Highway 2 outside of Sultan. Campers are invited to pitch their tents in an old pasture that the owners of this self-styled retreat center are reclaiming through composting, in partnership with food guilds, and hugel mounds (i.e., a type of raised garden bed). Hiking trails radiate in all directions into the surrounding national forest, but the real indulgence is something you won’t find at your state park campground: Copper Moon’s old-school wood-fired sauna, made out of corn cobs ($20/night; search “Copper Moon”). Love the olympic peninsula but hate the crowds? You’ll have 60 acres and a half mile of riverfront at your disposal at the Bogachiel River Camp near La Push. While you may never want to leave this private idyll—where you can swim, paddle or fish in the river and build a roaring fire with unlimited dry firewood—everything the Olympic coast has to offer, from forested hikes to coastal tide pools to Twilight obsessing is at your doorstep ($30/night; search “Bogachiel River Campsites”). Photograph by Mike Hoderman at Rose Garden. If you prefer glamping to camping, Cascadia Tipi Camp in the Trout Lakes region of southwest Washington is a great option. This backwoods retreat can accommodate as many as 12 campers spread among a tepee and three cabin tents; everyone shares the facilities at the cookhouse and can gather at a central bonfire pit for s’mores and tall tales. This is a perfect jumping-off point for excursions to see the Lewis River waterfalls as well as hikes into the wilderness on the flanks of Mount Adams ($75/night for the run of the place; search “Cascadia Tipi Camp”). For your next family reunion, rent out The Pond at White Owl Ranch, outside of Cle Elum. This private campground for groups large or small has toilets, showers and is set on 23 acres surrounding its own private pond. Don’t forget the fishing rod and the swim trunks. More recreational opportunities abound at the nearby Teanaway River and in the surrounding wildlands of the Wenatchee National Forest ($250/night; search “White Owl Ranch”). While Hipcamp may be cornering the market on private-land camping, other websites are making it easier to find and choose between public campgrounds. The Dyrt is a Portland-based start-up launched in 2015 to be the Yelp or TripAdvisor of camping and outdoor adventures. Users of the website or app can review campgrounds where they stay (as well as excursions they take with local guides) so future visitors can plan accordingly. Currently, The Dyrt lists more than 1,000 campgrounds—many of which are reviewed by multiple visitors—across Washington state in its publicly accessible database. Another new player in this emerging space is Campendium, which focuses on listings and reviews of RV parks across the country. Stealthy van or station wagon campers will especially appreciate Campendium’s listings of free camping spots where sleeping in your vehicle won’t raise the hackles of neighbors or the local authorities. Now, what’s your excuse for staying home?